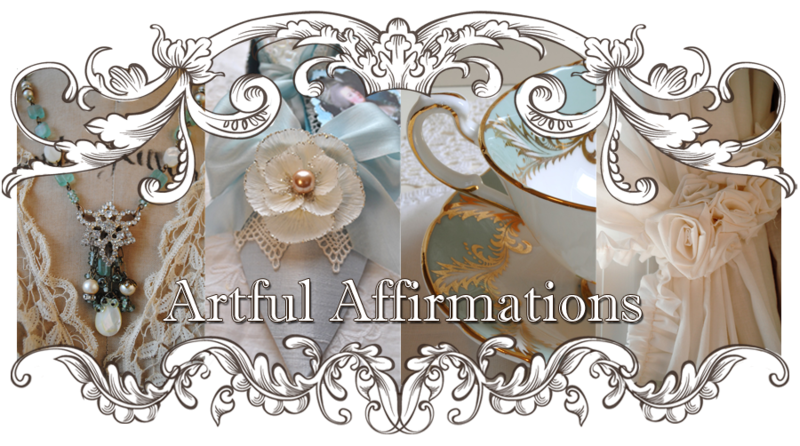 Artful Affirmations: Tea Cup Tuesday-It's Beginning to look a lot like Christmas! 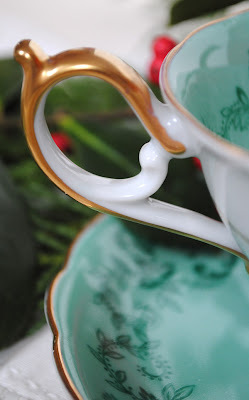 Tea Cup Tuesday-It's Beginning to look a lot like Christmas! I am home now from my travels. Visiting my family was wonderful, and seeing and holding my grandson was the best! Now, it is time for Tea Cup Tuesday once again! When I first saw this cup, I wasn't sure if I liked it....It has very unusual coloring and design, at least to me. The coloring is actually a little more yellow green than this, a really gorgeous color. Footed, and simply adorned with one thin gold line just the they have defined the waist. 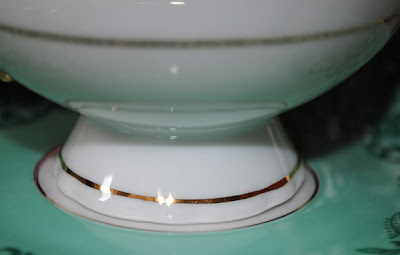 The elegant handle is highlighted with gold. I would call this handles shape a modified Kidney shape, with a prominent thumb spur. There is one single pink rose in the bottom of the cup. 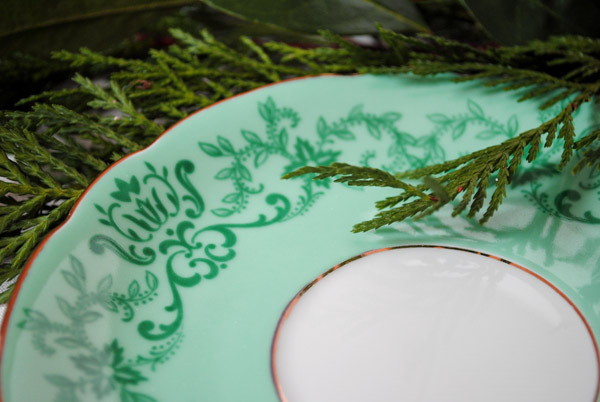 The plate and cup edges sweetly scalloped and trimmed with gold. The design is very interesting to me. Have any of you seen this type of style before? This backstamp was difficult to read, but I think it says "Royal Bayreuth". Bavaria, Germany US Zone. This cup was manufactured during World War 2. 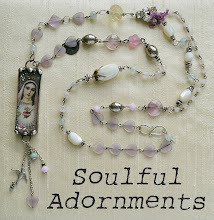 This company began in 1794 and was highly prized for it's designs by the Victorians. 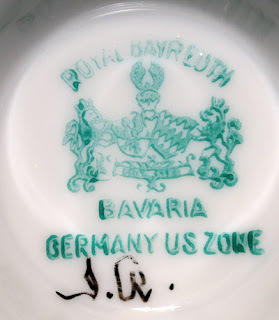 It's backstamp includes the Royal Coat of arms of Bavaria. I enjoy so much creating little gifts and cards. 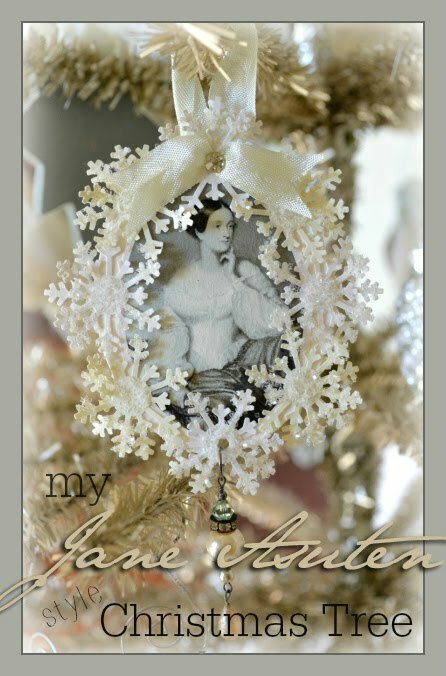 My Jane Austen tree is coming along and I will share it again for Deck The Halls Sunday. Thank you so much for coming by to visit today. I love having you over! 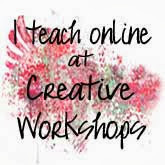 If you would like to join in and share one of your Tea Cups, just sign in with Linky Tools below. 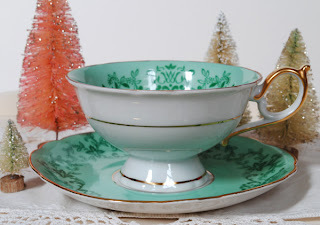 Oh Terri, I love this teacup! What a pretty colour! I love anything in the blue-green, aqua colour. Stunning! Thanks for sharing and have a wonderful week. What a pretty tea cup. Terri, your new cup is beautiful! I love the green, it's such a pretty shade. And the overall design of the cup is really lovely. I'm soo jealous! what a gorgeous teacup, I absolutely love the color! it's just so gorgeous! thanks for sharing it and Hosting another teacup tuesday! Terri ... very pretty cup ... i love the color! Happy Tea Day! it is alwys amazing for me to see how many china from Germany is in the United States. This is a pretty one and I love shape and color. How nice that you had a great time with your grandkids and family. Thank you for sharing this beautiful tea cup and for hosting this event. 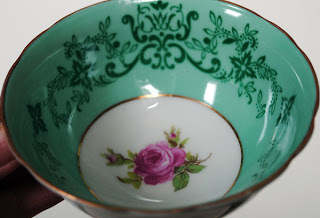 Had to sneak a peek before linking in, Terri - and how could you have questioned this cup I don't know - so lovely - especially the rose surprise at the bottom! 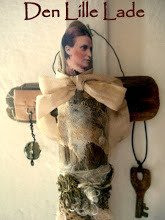 Now, as to the teaser about the Jane Austen tree - WHAT?? Can't wait on that! I'm saving my Jane Austen teatime for the new year - but your tree is happening in time for her birthday. How pretty Terri. I love the color of the teacup. If it's a shade of blue, I LOVE it! And looks a lot like your blog background! Have a great week! this cup is exquisite. 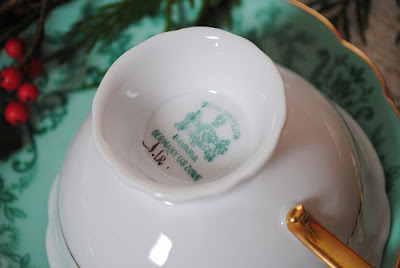 I linked up a special teacup from st jude! 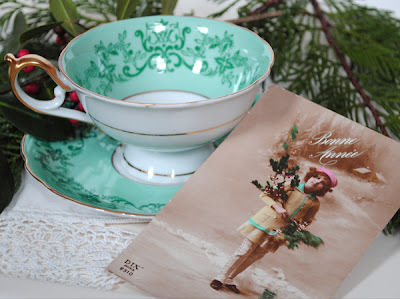 Amazing that you have an antique postcard that displays so perfectly with your lovely tea cup. Can't wait to see your Jane Austen tree. such a special c up!! Oh I would have grabbed this in an instant! I love the colors that are unusual -- this one is particularly striking with the footed cup and the scalloped edges! This week I'm not taking part in Tea Cup Tuesday, but anyway I came to admire your tea cup. It's beautiful both in shape and in decoration, a very outtstanding cup and saucer! 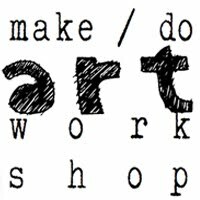 Thanks for sharing the information about the maker... it's something I value a lot. I think the teacup is beautiful! The color and the design is quite lovely and unique. I'm glad you got to be with your grandchild...nothing is as precious as holding a grandbaby. Terri...this is stunning...I love the colour! 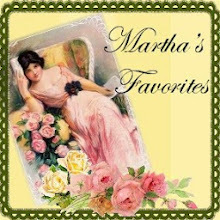 thanks so much for sharing...I love joining in on the tea cup fun...and will have to get on board again soon! oh...and thanks so much for your comment! It's a beauty Terri! I love Bavarian china. I have two different sets, one pink and one white with green dots. Thanks for sharing! Always love seeing your pieces. Your teacup is so gorgeous!! What an amazing color. Hi Terri~ Oooh, what a pretty cup! I have not seen a color quite like this. Thanks for hosting each week. I bet your tree looks wonderful~ I appreciate your visits to my blog. 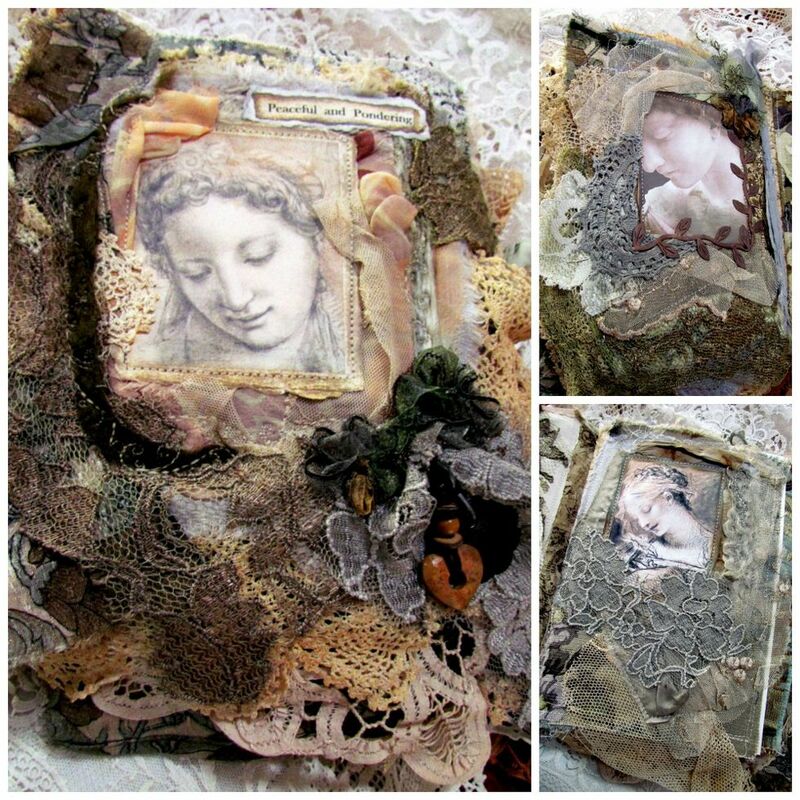 Super gorgeous as always Terri...love all your creative photos....stunning..and pure magic! Education is not the filling of a pail,but the lighting of a fire. 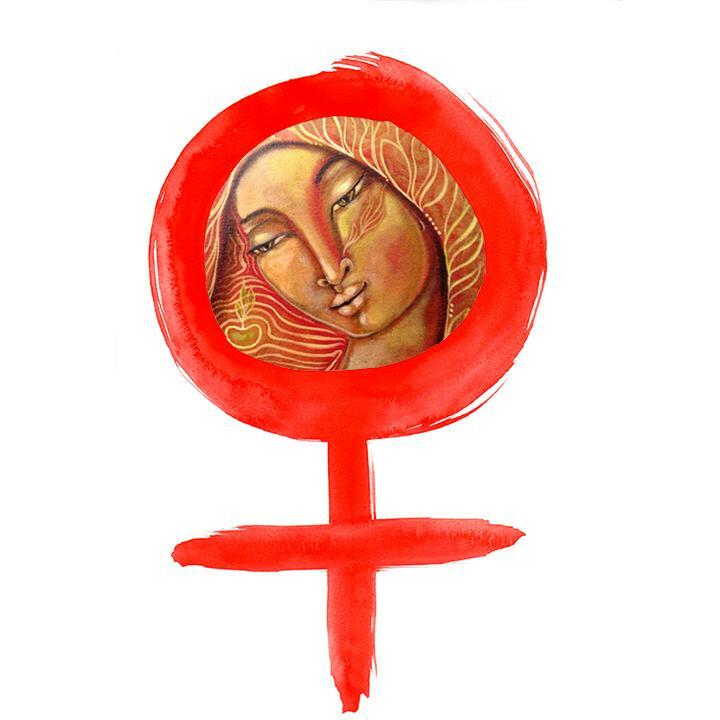 A human being is not attaining his full heights until he is educated MBA Systems in chennai! !